Photo by ~EvidencE~ from the Torontoist Flickr Pool. As costs for the Gardiner continue to escalate amid a traffic jam of bad news, the contentious project to build the portion east of Jarvis faces renewed opposition. When Council had its debate in June 2015, the East Gardiner was projected to cost $919 million. The alternate plan, a “boulevard option” that would see the East Gardiner removed, was projected to cost just over $461 million. The boulevard option would have created more economic development opportunities (2,100 more jobs than the so-called hybrid option), but would add two to three minutes in travel time to the 5,200 people who use the road every day. In a 24–21 vote, Council chose the more expensive option that was backed by the mayor and his allies. Now we learn that the East Gardiner project won’t cost $919 million. In fact, it will cost $1.4 billion. This isn’t the only urban highway cost increase. 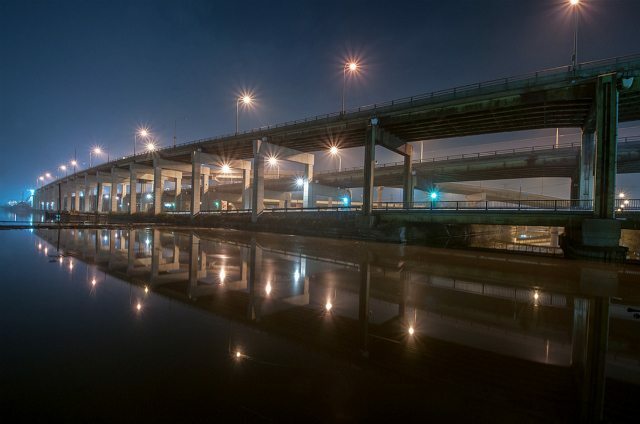 There’s repairs to be made to the rest of the Gardiner too. All told, the total cost has increased from $2.6 billion to $3.6 billion in one year [staff report PDF]. The cost to the City has increased by more than that, though. Toronto anticipated that the federal government would pitch in $820 million into the infrastructure project. But the feds aren’t interested, and unless that changes, the City will have to pick up the tab. That means it’s a total $1.8 billion cost increase to the City. For the same amount you could cover the cost of TCHC repairs over the next 10 years. The cost is so much that the mayor’s toll proposal, if implemented at two dollars, would see most of the funds go towards the equivalent cost of the Gardiner for years. At $2.6 billion, the Gardiner would take 70 per cent of toll revenue over 10 years. At $3.6 billion, tolls would not cover the cost, let alone leave money left over for transit or other infrastructure projects. Despite this new information, the mayor steadfastly supports the Gardiner project. Gardiner critics don’t see it the same way. Even a councillor who voted for the hybrid, Jim Karygiannis (Ward 39, Scarborough-Agincourt), hints that re-opening the debate could be…interesting. Rising costs, funding uncertainty could reopen Gardiner debate https://t.co/AdVEfVAfJ7 interesting Mayor won by 2 votes.1 of them me. Hum? In the original debate, many City staff supported the boulevard option, including chief planner Jennifer Keesmaat. We’re seeing more of that this time around too. While tolls are dominating public debate right now, we should focus on where we spend that potential revenue. Toll revenue, which wouldn’t kick in until 2024, wouldn’t fund the Relief Line or the Waterfront or Malvern LRTs. Instead, we should question the wisdom of spending $1 billion more than we have to in order to support an urban highway that serves 2,100 fewer jobs than the more affordable alternative. That’s a debate worth re-opening.